Learn how to quickly increase site visits, keeping visitors engaged and convert lookers into bookers. If you do the right things, your website can be your hotel’s best marketing and sales representative – it doesn’t call in sick, it doesn’t need to rest and it won’t ask you for a raise. 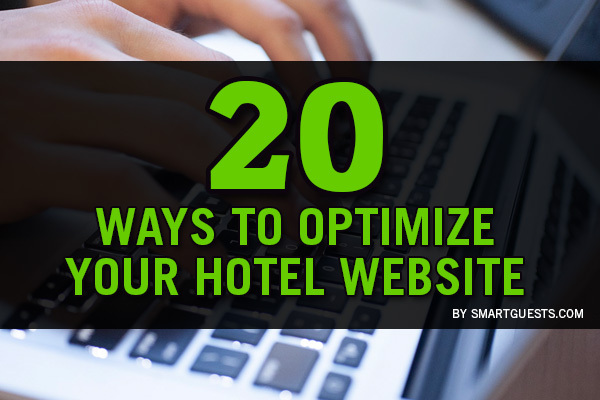 Kidding aside, given that more than half of hotel bookings are made online, you have to optimize your website so it gives potential guests a great browsing experience and compel them to book a room in your property. There are many ways for you to optimize your website for sales and marketing. Here are 20 of them. The mantra don’t judge a book by its cover does not apply when it comes to hotel bookings. Travelers want to see what they’re getting into. 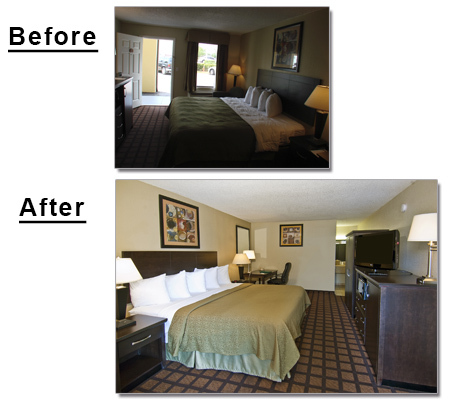 Make sure to use high resolution photos of your hotel on your website. Also, be careful about over editing your photos as there have been a lot of issues before when travelers felt trick because the photos posted on a hotel website are nowhere close what the property really is. No one likes a boring website that’s peppered with purely sales messages. Tell a story that travelers can relate to and would compel them to book with you. Don’t just say that you’re located at the heart of the city. Say that you offer a home away from home from which a new adventure awaits your guests at every turn. Social signals is an important factor in Google’s search ranking algorithm. It’s important to link your website to your social media assets so you’ll rank better in Google and other search engines. Also, linking your website to Facebook, Twitter, Instagram and Pinterest will make it easier for your site visitors to share your website’s content. Google 360 Tour will allow potential guests to virtually roam your hotel, as if they are actually there. 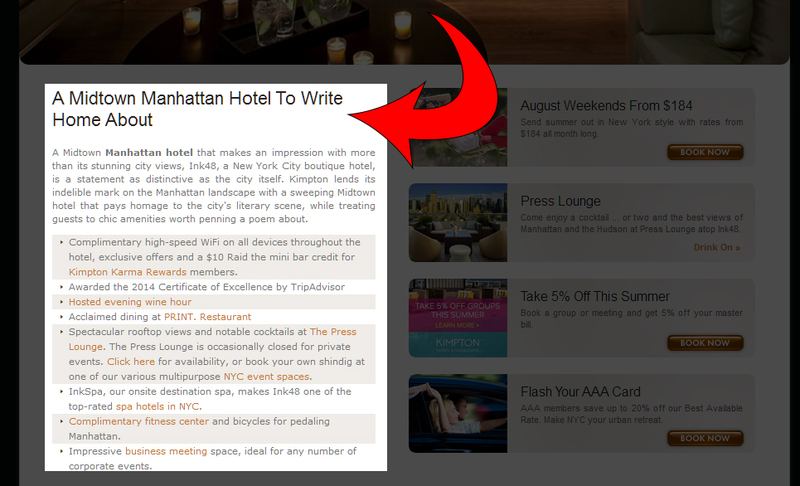 It’s interactive and engaging and can prompt your site visitors to book a room in your hotel. Why Your Hotel Should Have a Google 360 Tour. Displaying your phone number on the top of all the pages of your website will give your website more credibility. Having a prominently displayed contact number means that they can reach if they have questions or if they want to make changes to their booking. In short, a phone number can gain the confidence and trust of travelers, which is important if you want to get more bookings. Experts predict that mobile internet traffic will surpass desktop internet traffic by 2016. This is why you need to have a responsive website so you can deliver a great browsing experience to your site visitors regardless of the screen size of the device they are using. Take note that most last-minute bookings are done using a mobile device, so if you want to earn more from this, make sure your website is mobile-friendly. Content is king! And the easiest way to deliver great content to your visitors is by adding a blog section to your website. Blog about travel tips, must-see places in your area, restaurants they have to try – the list goes on and on. 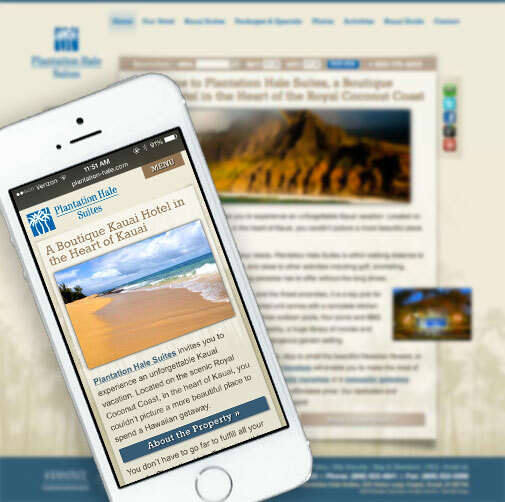 As a hotel, the goal of your blog is to help travelers plan their trip better. This is called “value in advance” – you already gave them something useful even before they book. This goodwill will then compel them to book with you because they would feel that they have to return the favor. Remember, your hotel is only one component of a bigger travel plan. The more reasons that you can give people to travel to your location, the better. A great way to do this is to have an updated events page on your website. List down local events as well as any event your hotel might be sponsoring. Keep the page constantly updated and provide valuable information such as schedule of activities, etc. Everyone is always on the lookout for the next great deal. On your home page, include the current promos and special offers that your hotel has to convince your site visitors to book a room with you. Aside from this “featured promos” section on your home page, have a dedicated page for special offers. There’s an old business mantra that says you can’t manage what you can’t measure. The same thing applies to your website’s performance. Adding analytics to your website will allow you to quantify information and pinpoint exactly what’s working and what’s not. Armed with this information, you can then do the necessary revisions to make your website perform better. They may not book with you today, but that doesn’t mean that they won’t book with you in the future. This is why your website needs to capture leads and collect emails so you can nurture your relationship with travelers and turn them into actual paying guests in the future. Call-to-action are essentially messages or prompts for your site visitors to take a certain action (i.e. Book Now! or Subscribe Today!). Your website needs a clear call-to-action. The general rule is to only have one call-to-action per page as to not confuse people with multiple messages. If your site visitors can’t find the information they are looking for, they will leave your website right away, and chances are, they will never come back. Make it effortless for your site visitors to find what they’re looking for by using navigation tools such as a well-structured menu, breadcrumbs and a search bar. The Internet is not really the safest place – it’s full of hackers, scammers and dishonest businesses. Displaying credibility proofs on your website can increase direct bookings because your visitors will feel safe doing business with you. Some of the most common credibility proofs include SSL certificates and credit card security badges. You can also post any award you received from credible organizations. Yes, there’s nothing wrong with looking at your competitors’ websites to get a few ideas. List down a list of hotels within the same category as you are and checkout their websites. Identify elements that you think you can add to your website and execute your own version. Compare your website to the websites 2-3 years ago and you will see a great disparity. Technology evolves and you have to evolve with it if you want your hotel website to be one your best marketing assets. There are a lot of great-looking websites out there that are not producing positive business results. 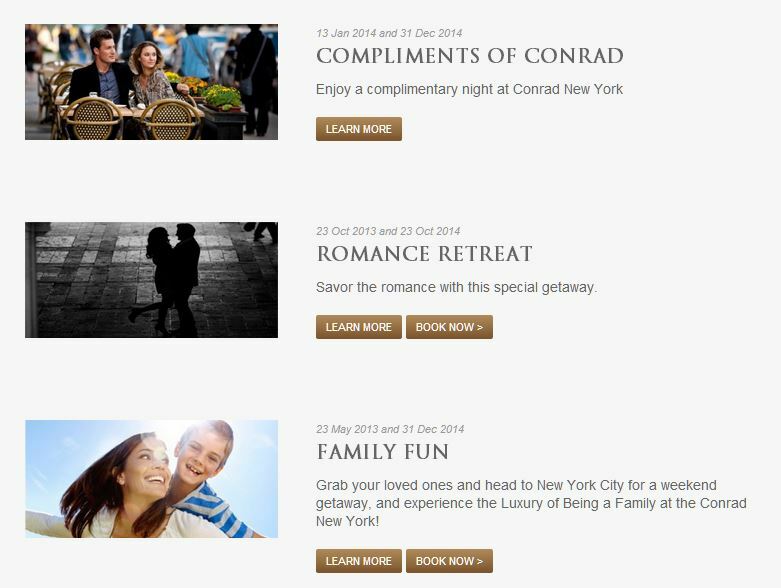 For your hotel’s websites, always test whether it’s resonating with travelers or not. Ask for feedback from your site visitors. 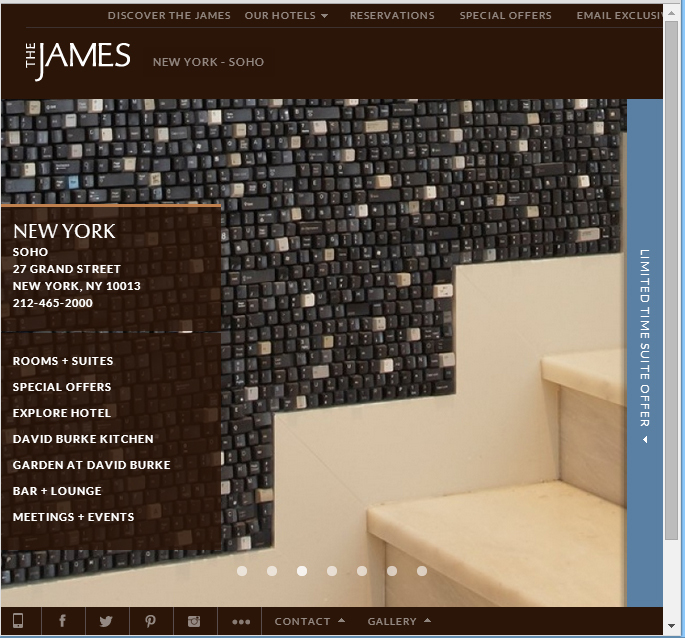 After all, a beautiful website is nothing unless it’s helping you meet your hotel’s business objectives. 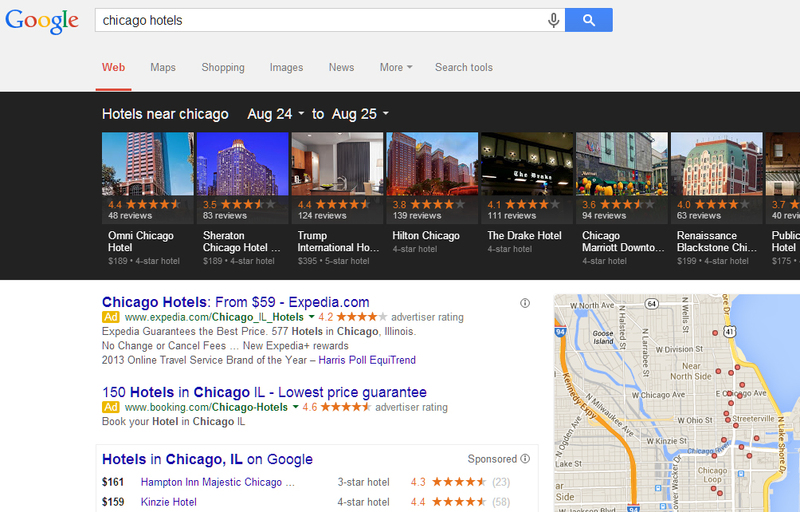 Your hotel’s website is still your best online marketing asset. Do it right and it will give you a steady stream of bookings. You don’t have to implement everything all at once. Start with the simplest things first and then move to the bigger ones. Rupesh Patel, hotelier and founder at SmartGuests.com, a U.S.-based Hospitality and Review Tools company that helps hotels increase revenues and occupancy, by boosting their online reviews and reputation. His proven system has not only improved his own hotels, but have helped hundreds of other hotels (large and small) get an advantage over their competition. He regularly shares his passion for entrepreneurship, customer service and marketing on numerous industry sites, social media and blogs. SmartGuests Blog © 2019. All Rights Reserved.